We do everything we do on Sunday morning- set-up, music, a sermon, prayer, kid’s ministry, etc. because as Jesus’ followers we are disciples who are striving to grow in loving God and loving our neighbors. God is in the process of changing, growing and shaping us. When we gather together on Sunday mornings we intentionally place ourselves, as individuals and as a church body, in a position to connect with God, hear from him and grow as disciples who live (by following Jesus and his commands) and reveal (as our lives and words encourage people to follow God) God’s kingdom. And God meets us as we come together! 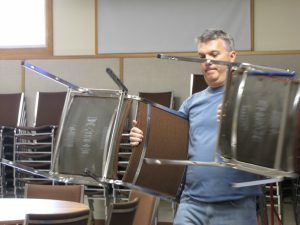 Setup Team – What you see when you walk into our worship space takes lots of work and lots of hands. But joining a setup team is a great first step in getting involved, and a great way to get to know people. Let Josh know you’re interested and he’ll be glad to answer questions and get you hooked up. Crossroads Kids ministry- If you love kids and love Jesus and want to explore opportunities to teach or assist, lead kid’s music or activities and crafts, etc., we likely have a place for you to plug in and we’d love to talk! Linda would love to answer questions and get the ball rolling. 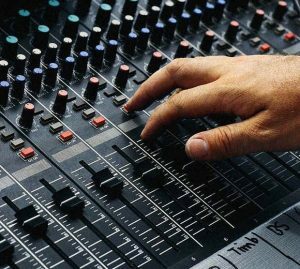 Tech Team – While we’re not the “techiest” group in the world we do have a pretty decent handle on the latest A/V equipment. If you like that sort of stuff, we won’t make fun of you, we’ll put you to work. Email Nathan for more information. 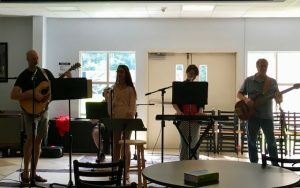 Worship Team – If you’re a musician or vocalist and you’d enjoy being a part of a team that helps lead people in worship each week, Nathan is the guy to contact. We’d love for you to plug in. If you don’t see a volunteer opportunity that looks like a good fit for how God has shaped you to serve, let Melba know how you’d like to serve. We’re pretty sure there’s a need you can help with!